Kagyu Droden Kunchab, St. Louis (KDK STL) is a non-profit Buddhist educational and religious organization under the direction of Lama Lodu Rinpoche. Our mission is to study, practice, and propagate the Buddha Dharma for the benefit of all sentient beings. The Karmapa described Lama as, "a Lama who has highly developed his inner practice." Lama Lodu Rinpoche was appointed resident lama of Kagyu Droden Kunchab in San Francisco in 1976 by His Holiness the Gyalwa Karmapa and His Eminence Kalu Rinpoche. He was born in Sikkim in 1942 into a Tibetan family. His grandfather, Lama Wongten, was held in very high esteem throughout the region as a yogi and general practitioner of the Dharma. Lama Lodu completed his preliminary training and education at the monasteries of His Holiness the Karmapa and His Eminence Kalu Rinpoche. He also studied and trained under the great yogi Drupon Tenzin Rinpoche and His Eminence Thrangu Rinpoche. Lama completed the traditional three-year retreat under H.E. Kalu Rinpoche, and then spent a period of time leading isolated retreats. He then went to Kalu Rinpoche's monastery in Sonada and served for seven years as puja master. Lama taught for two years at various European centers before coming to KDK. His Holiness, the Gyalwa Karmapa during one of his visits to San Francisco, emphasized that those who are interested in the teachings of the Buddha are very fortunate to be involved with KDK and should take advantage of the precious opportunity to study and practice the Dharma with Lama Lodu Rinpoche. Lama Lodu's teachings are very clear, unique, and profound. They touch the heart of everyone who listens. For example, during an initiation ceremony, Lama will explain every detail. This makes a definite difference in the students understanding of the method and makes it easier to experience the simplicity of the nature of mind. For every initiation Lama provides a translated sadhana, daily practice text, which previously were not available or had not been translated into English. The translated texts make it easier to understand and practice. Lama is very accommodating to anyone who wants to seriously practice meditation. Along with the text, he provides a full explanation of the specific meditation practice, the lineage of the practice, and answers questions to clarify the students doubts and confusion. Lama will also demonstrate a practice so that one can practice at home, and Lama has taped many of these practices as an additional study aid. 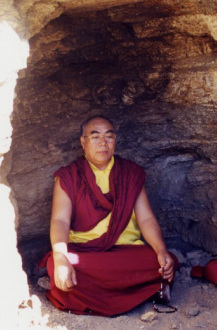 Lama Lodu Rinpoche's teachings benefit many people of all ages and levels of experience. His direct insight and simplicity as well as his humor and kindness make these teachings appear as transparent and brightly radiating five colored light, powerfully illuminating the truth. He teaches us to cultivate virtue and avoid wrong actions, stressing the value of true compassion as the key for liberation and supreme knowledge. In this era of disease, famine, war, and untimely death, we the students of this excellent Lama pray for his good health and long life. We rejoice in his guidance and pray that all may learn loving kindness for each other, and share his limitless profound realization until we reach Enlightenment. Under Lama's direction, students have completed the three year traditional Karma and Shangpa Kagyu retreat in 1989 and 2009. Fulfilling Kalu Rinpoche's wishes, Lama supervised the acquisition of retreat land in Mendocino, a new three year retreat facility, a week-end retreat facility, and the building of a stupa. Lama also fulfilled Rinpoche's wishes by rebuilding Kalu Rinpoche's homeland monastery (Ridak) and stupa in Tibet. Lama has supervised the translation of numerous practice texts (sadhana) and has written several books: Bardo Teachings (available through Snow Lion Publications) and The Quintessence of the Animate and Inanimate, Attaining Enlightenment, Maintaining the Bodhisattva Vow, and Homage to Kalu Rinpoche (available from KDK Publications). Out of the wellspring of his compassion, in the 1990's, Lama Lodu established the Sikkim Children's Educational Fund, a charitable organization which provides room, board, personal care, and a competitive education at the St. Joseph's Convent School in Martam, East Sikkim, his home town in India. Numerous students have graduated from this program to fulfill their dreams of a better life in this impoverished Himalayan region. Please consider lending your support to Rinpoche's mission!